From keeping your vehicle safe to serving as your workshop and more, garages are invaluable to families and businesses. 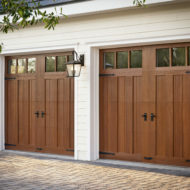 Equally invaluable are reliable, properly working garage doors. Most people open and close their garage doors numerous times a day. Over time, this consistent use will cause your garage door to act up. When this happens, there’s no need to come unhinged. 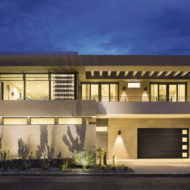 Door Pros—the leading garage door repair company in the Coachella Valley towns of Indian Wells, Palm Desert and La Quinta—is here to help. At Door Pros, we don’t just shut the door on faulty garage door operation. We slam it! That’s because we’re the experts at performing swift and reliable overhead garage door repairs. No matter what garage door repair service is needed, we give you our word that we’ll size up and fix the problem properly—and we’ll do so right away! You might be tempted to try to fix your garage door yourself, but garage doors are complex mechanisms. Repairing them isn’t as easy as some people think. In fact, from Palm Desert to Rancho Mirage, our garage door repair company has the experience and skills to fix whatever challenges you face with your garage door. Whether your garage door is getting stuck halfway or won’t budge at all, you don’t need this kind of aggravation. Your problem might be addressed with a quick repair. Or, perhaps you need a replacement. Either way, our garage door repair company in Indian Wells will help you unlock the right solution. Garage doors can be noisy—especially older ones. If your garage door’s creaking or straining becomes excessive, then you might have a problem with springs, the opener bracket or the opener itself. These are issues you don’t want to stay quiet about! 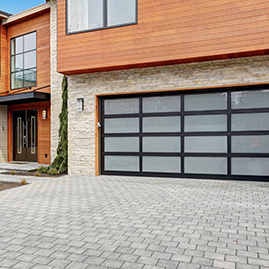 One key to worry-free garage door operation is staying on track—literally. However, from an aged door to one that’s bent out of shape, you can’t keep a garage door on its tracks if it’s in poor condition. When this happens, there’s only one way to get your door operating smoothly again. That is to open your door to our garage door repair services. In life, staying balanced will help you avoid a lot of headaches. The same stands true for your garage door. Better yet, checking whether your garage door is balanced or not gives you the ability to shut the door on potential overhead garage door repairs before they come knocking. So, once a month, disconnect the garage door opener from the door. This will allow you to manually open and close it. Next, position your door so that it’s in between open and closed. Now, release it. Your door shouldn’t budge. If it slides down or rises, it’s an indication that you’ll need garage door repair service soon. So, ring us right away. After pressing your garage door opener, your garage door should open or close within a second or two. If there’s a delay in its response time, it means something is amiss with your opener or your door. If this happens, contact our overhead garage door repair company right away! The quicker you address a problem, the more likely the garage door repair service your door needs will stay in line with your budget. 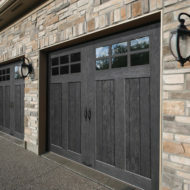 For many reasons (safety being among the most important), garage doors need to operate smoothly. If your garage door shakes, it’s typically an indicator that it contains broken parts that are causing it to move unevenly. The same can be said for a garage door that hesitates when you open or close it. These jerking movements could lead to a complete collapse, which can be disastrous. Getting your garage door inspected immediately is your best chance at an affordable repair rather than a costlier garage door replacement. When energy bills spike, most people believe their heating and cooling systems are the culprits. But, there’s a third suspect. It’s your garage door. If you have an older garage door, then chances are it’s using more energy than necessary. Newer models are far more energy efficient, helping you to save money in the long run. In a Jam? Not with Our Pros! Here’s the key to unlocking the quality of service and care you deserve: Turn to Door Pros. From the Sacramento area to the Coachella Valley, Door Pros delivers the most dependable garage door repair services around. But that’s not all that’s behind our company’s doors. 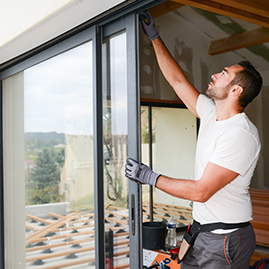 From weather stripping services to sliding door repairs, we’re experts at handling any type of door service our residential and commercial clients need. For you, our door is always open. Go ahead and give us a ring. We’ll come knocking with our top quality repairs in no time.